INJURED Carlton star Patrick Cripps is in no danger of missing round one, according to Blues leadership group member Sam Docherty. Cripps was diagnosed with a stress reaction in his lower back late last month, an injury that is expected to sideline him until late February. The Blues midfielder was an onlooker during the club's pre-season training camp at Southport Football Club on the Gold Coast on Sunday and will be on a modified program for most of the summer. 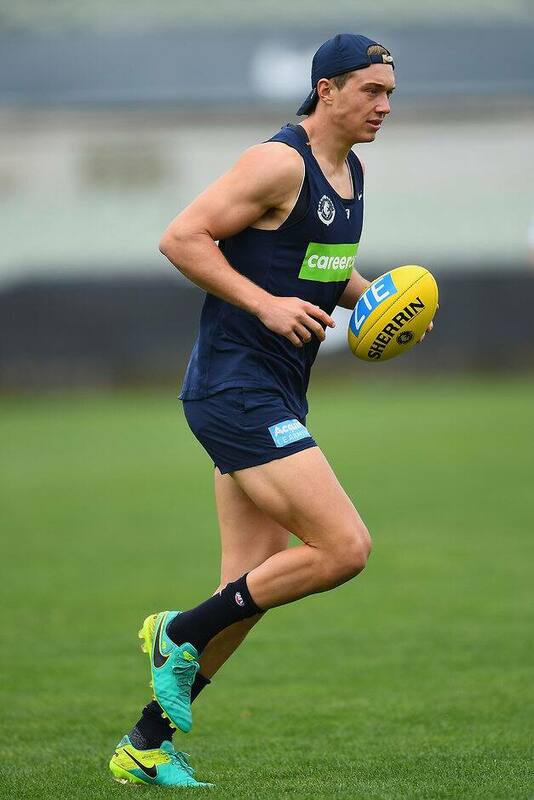 But Docherty said he had no doubts Cripps would be ready for Carlton's round one clash against Richmond on March 23. "He's a resilient bloke and he's very professional. The aim is for round one and he's doing his rehab according to that," Docherty said. "He'll be fine, I guarantee he'll be ready to go. "From the advice that I've got from people at the club and from him it seems like it's probably going to be a bit of a rest for now, but he'll be able to reload somewhere in January and obviously the games start in March, so we've got plenty of time." Fellow midfielder Bryce Gibbs trained strongly during the Blues' session on Sunday, having returned to the club in outstanding condition following his unsuccessful attempt to cross to Adelaide in October's trade period. Gibbs and his partner Lauren have a one-year-old son Charlie, with the 2014 Blues best and fairest winner requesting a trade to the Crows so he could be closer to his family in South Australia. Gibbs' desired move home fell over when Adelaide failed to come up with a trade that satisfied Carlton, where the midfielder is contracted until the end of 2019. Docherty said Gibbs had spoken to his teammates about the reasons behind his requested trade and held no grudges against the Blues. "He's been great. He rocked up day one and ran some really good times in our testing and came back in probably [the best] physical condition that he's been in," Docherty said. "As a fellow player, I was rapt with the way he rocked up as a leader of the club … and came back in really good condition. "He was open and upfront about it (what happened in the trade period). He's hasn't got a grudge against the footy club or against the players or anything. "It was just something that happened and we've moved on and hopefully we can have a really big year from him."